When a person has complex needs, as do those who live at Community Solutions, it is important to provide them with a safe environment where they can learn and develop their skills - and maximise their potential. Individually designed, person-centred programmes which incorporate a range of activities, meaningful to each person, aim to give our people the widest possible range of life opportunities. Full advantage is taken of Community Solutions' location in an active community, within which the service is positively integrated. With residents working in and actively using local and more distant facilities, we believe this integration is a great strength and offers many meaningful, positive and developmental opportunities. The range of learning opportunities is wide and includes social, personal and lifestyle experiences, as outlined below. 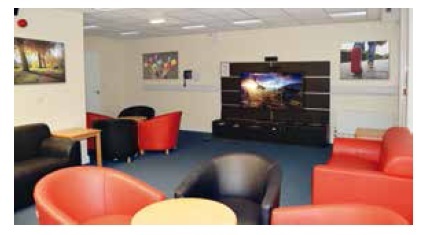 Further education facilities can be accessed at the local college as well as in other Hesley Group services. People are encouraged and enabled to make their own choices and decisions about their personal plans. Each plan is monitored to ensure that activities are balanced according to individual needs. Depending on these needs and the choices made, a broad range of activities can be accessed in the local and wider communities and at other Hesley Group facilities, which can include horticulture, art and crafts, eating out, visits to local and national attractions, trips to the coast, local walks, cinema, bowling, swimming, gym, dance, shopping, sensory club, cycling, woodwork, music, performing arts, voluntary work, access to local colleges, work placements, local walks, including through the local rambling club, and the local social club. Community Solutions also has its own facilities to host social events, to which friends and family can be invited. Shopping and cooking for themselves, with support as required, is a regular activity for people at Community Solutions, as is cleaning and tidying their home. Progress is monitored through the person-centred planning process. Successes and achievements are celebrated by fellow residents, staff, family and friends. The residential living model employed at Community Solutions supports each person to have a varied and fulfilling life. People are supported to identify their own needs and voice their aspirations, with abundant opportunities for these to be realised. Progress is recorded and reviewed on a regular basis by the team that supports each individual.